Learn@UW-Stout users have access to a student centered media content repository powered by Kaltura. My Media allows students and faculty to create and collect audio and video that can be shared within Learn@UW-Stout. Faculty can share media in the Learn@UW-Stout news, content, discussion, dropbox and quizzing tools. 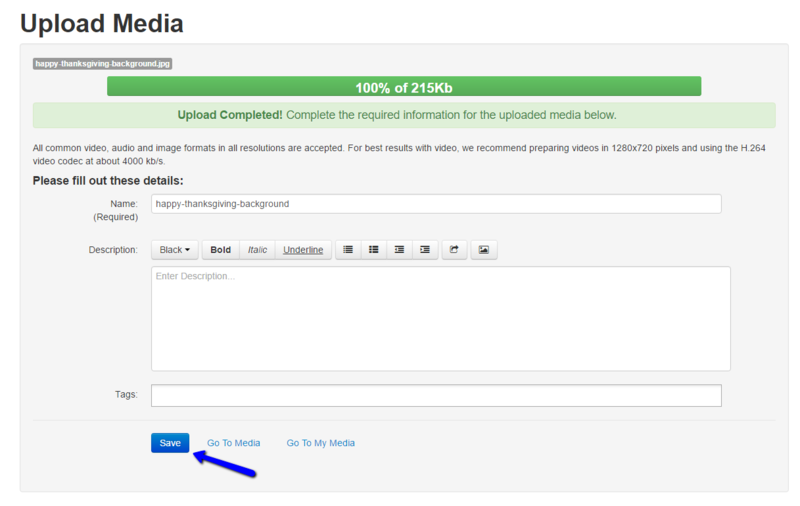 Students can share media content in the discussion and dropbox tools. Create, edit and save your video using video editing software. Windows Movie Maker or iMovie work well. UW-Stout offers tutorials on the use of these tools. When you are satisfied with your video open, “My Media” in the “Other Tools” dropdown in Learn@UW-Stout. Within the "Add New" menu, select "Media Upload." Click "Choose a File to Upload." Find and select your video when the “Choose File to Upload” window appears. Once your file has uploaded, name your file. Click “Save” The video will be converted to a proprietary format that can be streamed within Learn@UW-Stout. Return to the main My Media page to verify that your file uploaded properly. Captions - Upload multi-lingual captions to reach international, multi-lingual, and hearingimpaired audiences while also enabling in-video search within the captions. Deleting a video from “My Media” will prevent others from viewing your media. My Media is for academic purposes only.